Great Descartes' ghost, Batman! 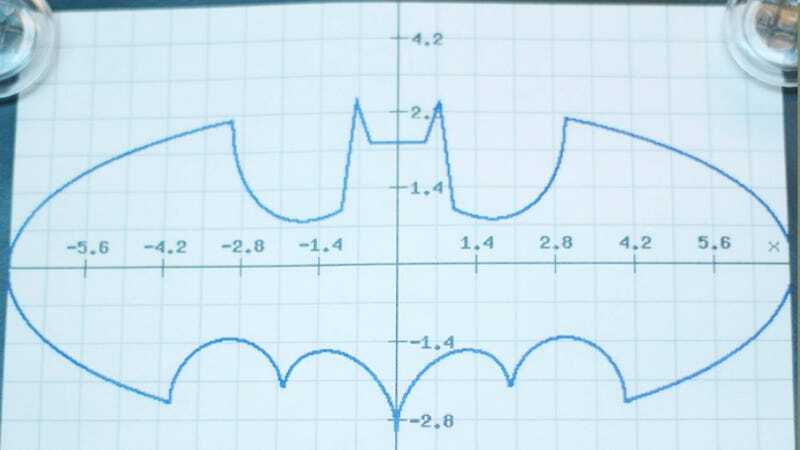 The Batman equation, that Cartesian forumla that when plotted gave you the Batman logo, is a total lie! Or at least in error, says another mathematician! [Update: He's wrong!] Math fight! Math fight! Italian computer scientist Michele Filannino says that while the terms are correct, its general formulation is wrong. Filannino explains that the logo "is formed by multiplying six terms and then setting the entire expression is equal to zero. This is a conceptual mistake. In order to plot the Batman's logo you have to plot the six different terms separately on the same graph. Each term must be set equals to zero." In very basic terms, for the equation to work you have to overlay six graphs on to of each other to get the logo. Or so it would seem! Filannino shows his work on his blog, but I'm quite honestly too ignorant of both the Cartesian coordinate system and Italian to do anything other than grunt concernedly at it. Is there a Cartesian mathematics expert in the house? Update: It turns out that there is a Cartesian mathematics expert in the house. Ron Avitzur, who wrote the Graphing Calculator for Mac OS (which is a fantastic story in its own right) says it works, with some modifications. I took a look at the so-called Bat Man equation in my software. It's not a lie, but it only works if you evaluate it over complex numbers rather than just real numbers. sqrt((abs(abs(x)-3)/(abs(x)-3)) which evaluates to 1 when -3 < x < 3 and the complex number i outside that range.